Having signed from the Northumberland side East Chevington Juniors in June 1947, Dave Blakey found that the demands of national service, during which he played for an army XI against an F.A. XI that included Ray Middleton and Stan Milburn, contributed to a five-year wait for a regular place. This wait was not made shorter by the decision to promote Bill Leivers over Dave when Ken Booker left. Some of Dave's early, irregular appearances were at inside-left, but when he came into the side at centre-half for his forty-third appearance on September 6th., 1952, he stayed there, enjoying an unbroken run of 244 League games: he did not miss another until November 30th., 1957.At the end of the '57-8 season, in a famously dirty match against Bradford City, Dave was sent off for dissent after only thirteen minutes. At the start of the '63-4 season Dave was dropped for the first time, losing his place to Ronnie Hinton: that match proved to be Hinton's only League game for Chesterfield, and Dave was soon back in business at the heart of the defence. A much stiffer challenge was offered the following season by the emerging Albert Phelan and, as advancing years began to catch up with Dave, the youngster gradually became the club's first-choice number five. The later years of Dave's playing career were dogged by a dispute over a benefit that dragged on for six years. He became eligible for a £1,000 benefit payment by April 1958, but Harold Shentall, the club's Chairman, declined to pay this, on the grounds that the club were heavily in debt and such payments were not compulsory. A year later, Dave went on the transfer list at his own request: the club had declared a surplus of £2308 on the season, yet the matter of the benefit was, to his way of thinking, still outstanding. By March 1962, things had improved to the extent that Dave was talked about as being the club's first Player-manager. Tony McShane was given the Manager's job and tried to find a solution to Blakey's problem: eventually, in April 1964, Dave got his well-deserved benefit, being the joint beneficiary (with Ron Powell) of a match between a Manchester City XI and an 'International Stars' team. Dave Blakey retired at the end of the 1966-7 season. 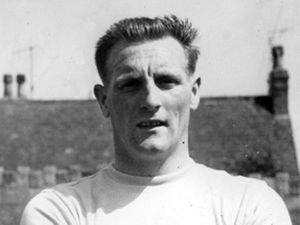 He had spent almost all that season in the reserves but was brought back for an emotional farewell in the final home game, against Port Vale, on May 8th., 1967.His first-team career had lasted for a few months short of twenty-one years and he received a Football League long service award in recognition of this fact. Dave is the club's record League appearance-maker, and is likely to remain so, following the "Bosman" ruling. The fact that he stayed for 617 League games and 658 first-team appearances in the three major competitions may have had more to do with the archaic "retain and transfer" system that tied players to clubs as if they were possessions, rather than people. As Dave's career progressed he saw a number of transfer requests turned down by the club, yet supporters tended to sympathise with the team's wholehearted skipper because of the iniquitous situation that the laws put him (and thousands of others) in. After retirement he stayed at the Rec briefly, to run the club's auxiliary fund while his wife ran a general store in Tibshelf, but he left in November 1967, craving a more active involvement in the game. This he found as a scout, at Burnley (witness the number of local lads that turned up in claret during the 1970s!) and, most notably, under Don Revie at Leeds United. Although settling in the Doncaster area Dave still attended Saltergate regularly beyond the turn of the 21st Century, usually watching matches on behalf of Doncaster Rovers. For Chesterfield: 617 league appearances, 20 goals.